There are two perpetual temptations in worship. The first is to believe that older is automatically better. The group clings to the past like it is a magic charm. To them it is a window to better days when the church was “more pure.” There is no maturing in the church for this group. For this group, worship music is largely culturally defined, but the culture is an older one. The second is to assume that newer is automatically better. The culture has moved on from “Holy, Holy, Holy” and if the church is to reach the culture she must move on as well. There is very little to learn from the early church for this group. For this group, worship music is to a large degree culturally defined, but the culture is only the newest one. Let’s be clear, while the first error does exist, it is the second error which is the great temptation of our age. We must move on. We must be relevant. The great sin of our age is to look old. At Christ Church we would like to avoid both these errors. As we pursue reformation in church music here are some things to remember. They are not in any particular order. We should be grateful for what we have. We live in an age of complainers. We whine about everything, including church music. Yes, there is always room for improvement. Yes, we all cringe at certain songs. Yes, it would be nice if we had the Psalms that were not paraphrased set to music. Yes, it would be nice if we had better contemporary music. But God has been good to us. We have a great musical heritage from Ambrose to Luther to Wesley. We have more and more Psalms being set to music every year. Growth comes from gratitude not from grumbling. Any reformation in church music must be built on the foundations of love for Christ and love for his people. If we seek reformation because we want to be “traditional” or because we want to be “relevant” we are going to make fundamental mistakes. Love for Christ and love for the Church form the center. Singing in worship revolves around two primary things: faithfulness to God’s Word and the voice of the people. Everything else is important, but secondary to these two things. This is why our fathers chanted. They could chant the Word of God exactly as it is. And chanting highlighted the voice of the people. Musical growth is dictated by God’s Word not by our current culture. That means our primary means of evaluating our singing will be the Bible. 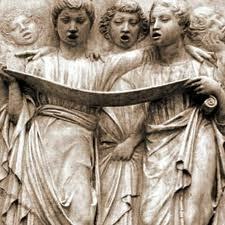 We should want to thoroughly ingest the older songs and the older ways of singing. These men are our fathers in the faith. We should sit at their feet before we seek to stand on their shoulders. This does not mean we will like all their songs or methods. But it does mean that each church should seek to live within the stream of Christian tradition. No church should sing only new hymns and choruses and completely reject the older tradition. This only shows arrogance. We should seek out new, theologically sound music to introduce to the congregation. No church should only sing older stuff. I do think a lot of newer stuff is weak, if not heretical, but not all of it is. There are God-honoring songs being written. We should not be afraid of incorporating these into our local church music. We should be cautious in accepting worship music advice or songs from theologically inept musicians, whether they are on a church staff or in the pew. Here is why a lot of contemporary worship music is weak: worship music in the modern church has ceased to be overseen by the elders of the local church. I am not saying they must do it all. But they must oversee it all. Music is a teaching ministry. If the church is to have theologically robust songs they must have theologically robust men writing them and evaluating them. The elders are the guardians of God’s Word. Yet for some reason they leave one of the most potent parts of worship up to other men or women who are not fit. Here is what Titus 1:9 says an elder must do. “He must hold firm to the trustworthy word as taught, so that he may be able to give instruction in sound doctrine and also to rebuke those who contradict it.” Too many worship leaders and those who write church music do not fit this description. Each church can and should have its own local sound that uses local talents and resources, but still functions within the tradition of the broader, historic church. If you have a piano player, then don’t grumble because you don’t have drums or guitar. If you have a guitar player, use him. If you have no instruments, learn to sing without them. Two churches separated by thousands of miles should sing songs that have similar content and doctrine. This comes from faithfulness to God’s Word. But these same two churches may sound very different. This does not mean sound is irrelevant. Some sounds are inappropriate for worship. They drown out the voice of the people. Or they are designed to create false emotional responses. Or they are designed to highlight the musician instead of the people. Or they are associated too closely with worldliness. The musical sounds in our churches will vary, but that does not mean any sound is acceptable. A very well- balanced article.